Joe Gere said he died on the afternoon his twelve-year-old daughter Brenda disappeared. It was left to Brenda's mother Elaine to sustain her stricken family, search for her missing child, and pressure the authorities for justice. From the first minutes of the investigation, suspicion fell on Michael Kay Green, a steroid-abusing "Mr. Universe" hopeful, but there was no proof of a crime, leaving police and prosecutors stymied. Tips and sightings poured in as lawmen and volunteers combed the Cascades forest in the biggest search on Northwest history. Years passed with no sight of the blue-eyed girl or the bright clothes she'd worn on the day she disappeared, but Elaine remained undaunted. Salt of the Earth is the true story of how one woman fought and triumphed over life-shattering violence and how she healed her family-and herself. 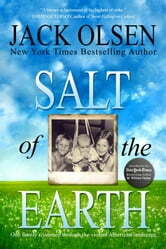 Jack Olsen deserves every word of praise already accorded him for this book. Elaine Gere proved to be absolutely awesome in her loyalty, tenacity, convictions and love for her family and extended family. Full of admiration for Elaine, Jack Olsen and this book.